As we head into September with the knowledge that the remainder of the summer season is short lived, I have found myself looking back over the last few months and thinking what a generally lovely time it has been. So much has happened already this year and I find myself feeling a strong urge to simply stop and take it all in. Perfume has obviously played a big part over the summer and the fact that I’ll soon be retiring some of my summer scents in favour for my winter wardrobe has made me feel more than slightly melancholic about those scents which have carried significant favour through the hotter months. In this post I’m taking a look back on the events of summer 2013 and the scents that have made it so fabulous. When I say scents, I don’t just mean the fragrances I have worn but also the odours that have accompanied many a wonderful occasion and have helped cement each day as a wonderful, joy-filled memory. In April my father married my step mother and whilst I’m fully aware that summer would not have technically started at that point, I still feel it is important enough a memory to include in my scented look back at the season. For day one of the wedding I wore a rather snappy electric blue suit (accented by Alexander McQueen bow tie and Butler & Wilson lapel bling, naturally) and chose Maison Francis Kurkdjian’s cerulean coloured OUD to match. The wedding itself was rather unconventional, starting at St Pancras International and including a trip on an old London bus, a ceremony in a beautiful art deco hall and a wedding breakfast at a Marcus Wareing restaurant. The scents of the day were vivid and varied – from the diesel fumes of old Routemaster buses, accompanied by the sour fizz of one too many glasses of champagne to the umami odour of delicious scollops. It was a truly beautiful day, not just because of the smells that made it so memorable, but for the happiness on my father’s face – that I shall never forget. Next came July and my graduation. After two long (and relatively painful) years studying for a Postgraduate Diploma in Human Resources Management (boring, I know), I was finally able to graduate. To this day I don’t know what was a greater feeling – the sense of pride I felt when collection my diploma or the simple relief of knowing it was all over. 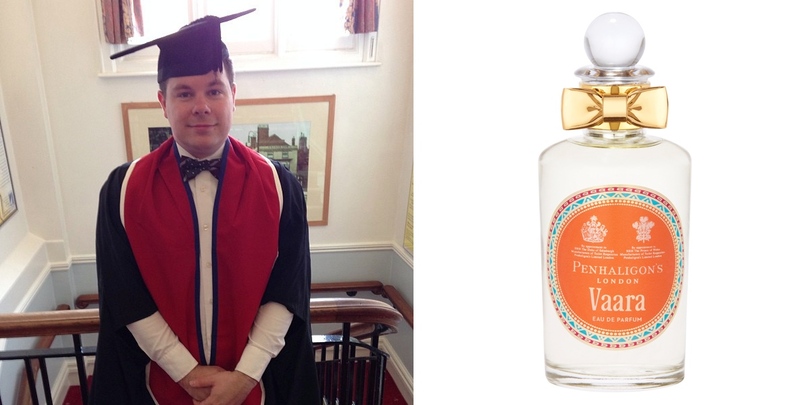 For my graduation scent of the day I opted for Penhaligon’s Vaara, a truly regal and exotic perfume that seemed befitting of the formalities of the day. The funniest thing I found on becoming a graduate was the immediate sense of achievement I felt the minute the gown I donned the famous cap and gown. It was an incredibly hot day and the air was permeated with sweaty graduates trapped in the stuffy halls of musty university buildings. But these were students in their finery, which nowadays involves an intense haze of perfume, hairspray and fake tan. Class? – Maybe not, but most definitely distinct. 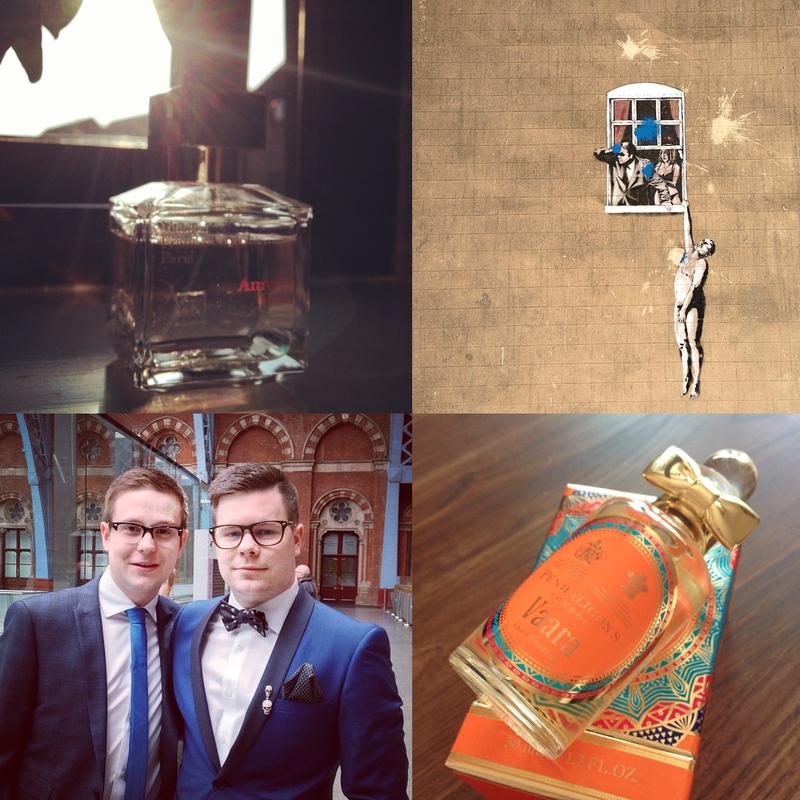 Later in July I was honoured to be invited back to Perfume Lovers London to deliver my second Summer Special. The theme this year was an ‘olfactory world tour’ where all in attendance would be taken on a trip around the globe, stopping off in exotic locations, all through the medium of perfume. To represent the colourful and vibrant city of Bombay I had selected Neela Vermeire’s triumphant Bombay Bling! and it was this perfume that I chose to wear whilst delivering my talk. In the humid London air my skin was cool with a kaleidoscope of fruit and flowers that provided me with the confidence and exuberance to deliver my talk with very few nerves. The day after my Perfume Lovers London talk Nigel and I set off on a road trip to the artistic and cosmopolitan city of Bristol to visit my best friend. It was the first time either of us had visited Bristol and we were more than just a little bit excited to hang out with our bestest bud. Long trips in cars are never comfortable, especially in the summer when air conditioning brings cool air but also dryness. To combat both the heat and the air conditioning woes I opted to spritz on copious amounts of Masion Francis Kukdjian’s Aqua Vitae, a perfume that hovers just above the skin, casting shadows of yellow sunlight. Upon arriving in Bristol we soaked up the sights, sounds and smells of what turned out to be a fascinating city. The floating harbour smelled positively ripe under the blazing sun and as we walked alongside it we could smell the intense odour of hot metal from the train tracks that run parallel to the water. The rest of the trip was spent exploring shops, markets, spying Bansky’s works of art and eating one metric ton of Chinese food. Time spent with friends is always the best but time spent with friends in a wonderful city is even better! As is British tradition, our final trip of the summer was a family outing to the seaside. Nigel and I, accompanied by my older brother and sister, sister-in-law, father and nephew chose to the quaint seaside town of Aldeburgh, a place which we would frequent once a year as kids. The weather was muggy and overcast (as one expects a British trip to the beach to be) but that didn’t matter, we were on the beach with fish and chips, ice cream and our nephew who had seen the sea for the very first time that day – his reaction alone was worth the trip. What are your scents of summer 2013? Do you have any key memories linked with smells this summer? Image 1 my own. Image 2 my own and via franciskurkdjian.com. Image 3 my own and via ahalflife.com. Image 4 my own and via shinycreation.com. Image 5 my own and via fashionone.com. Image 6 my own and harveynichols.com. Posted in Article, By Killian, Maison Francis Kurkdjian, Neela Vermeire, Penhaligon's and tagged Aldeburgh, Aqua Vitae, Bombay Bling!, Bristol, By Kilian Love, London, Maison Francis Kurkdjian, Neela Vermeire, Oud, Penhaligon's, Perfume, Summer, Summer Fragrances, Summer Perfumes, Summer Scents, Thorpeness, Vaara. Bookmark the permalink. So happy to read of the wonders you have been experiencing! Our summer, at least the weather, has only begun in Los Angeles, however being old fashioned it is time to stop wearing white! While it seems we do have an eternal spring, I don’t care the season, I wear what I love. It tends to be vanillas, ambers, gourmands, like a touch of sweet, not cloying kind. I do not personally know many you have mentioned. I do love Kilian Love and others. Sweet Seduction is a spring/summery staple for me, with it’s wonderful orangy entrance! Here in LA we always smell gasoline, our car culture. The beachy scents begin at the coast and change as we go inward, even ten miles makes a difference. As we are indoors or in cars much, I don’t think I reflect much on the scents in my enviroment, other than restaurants. Tonite, Moroccan and delightful!!! Now I think I will be more aware. I enjoy your writing and find I very much agree with your assessments and the fragrances you enjoy the most Best wishes to you! And CdG Avignon which I just bought last week in remembrance of a wonderful friend who died last month and used to wear it a lot. Sabine, I am very sorry to hear about your friend. Avignon sounds like a wonderful way to remember them. I keep meaning to but a bottle of Portrait of a Lady. It really is something else isn’t it? Did you find M/Mink a bit too odd? Gasoline, beachy scents and Moroccan food? It all sounds wonderful! Thank you for sharing. It’s interesting what you say about seasonal fragrances, I find that I still wear some heavier scents in the summer (because, like you say we should wear what we want when we want) but there is a marked difference in my summer rotation than my winter. Impossible Iris by Ramon Monegal always reminds me the wonderful time I spent in Barcelona this summer. Oh how lovely! I’ve not tried any if the Monegal scents. Would you recommend them? I shall seek some out! Not at all, I shall head over for a read! Looks like you had a nice summer. Mine wasn’t all that memorable overall. There were more lows than highs. I did purchase a few bottles I’d been dying to have for a while including Rubj. We did have one getaway where the innkeepers were involved in parrot rescue and had a fabulous bird room at the inn. One of the cockatoos fell in love with my hubby and me. He was so adorable and smelled like musky fruit from the pellets she fed him. The bird, not my husband. Sorry to hear that your summer has been less than perfect! It does sound like you had some success perfume wise though. Rubj is truly wonderful, I’m so glad you’ve picked up a bottle. Welcome back to the world of perfume!! Thomas, this is such a great post. It sounds like you had a wonderful summer with equally wonderful smells to accompany it. We don’t look back and savour recent memories often enough. Or if we do, it’s usually the bad ones. Reading about your summer and looking at those great pics makes me realise how good it can be to pause and take stock. I’ve just come back from 3 days of helping my sister with her house move so I’m too exhausted to even remember what perfume i’ve mostly been wearing but it’s been the summer of learning Salsa so that’s been good. It really was a very lovely summer indeed! P.S. I haven’t forgotten your email, shall reply today.